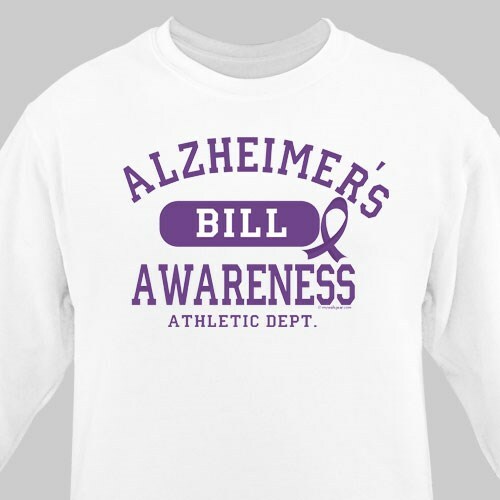 Our Alzheimer’s Awareness Athletic Dept. Sweatshirt is a great way to proudly show your love, compassion and never ending support in finding a cure. Make this Alzheimer’s awareness shirt a great addition to your next awareness walk event. Great cause and great shirt! Additional Info Awareness is the key to finding a cure for all diseases. That is why we strongly encourage all to show their support. Show your support for loved ones battling Alzheimers with our large collection of Alzheimer’s Awareness Apparel & Walk Gear. Our awareness apparel is great for walk events, fundraisers or just to show your support every day. Next time you’re at a community awareness event, be sure to wear this Alzheimer’s Awareness Sweatshirt.